Star Wars Episode VII’s main story is great and all, but have you heard about how dashing Resistance pilot Poe Dameron and C3PO saved rescued Admiral Ackbar from a First Order Star Destroyer? Let me tell you all about it. The prequel-based Lego Star Wars made three so-so to horrible films endearing. 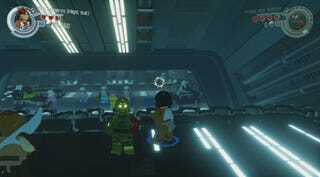 Lego Star Wars II gave fans a chance to revisit the original trilogy in an entertaining new way. Lego Star Wars: The Force Awakens’ core game transports us back to half a year ago, when we saw a movie we mostly liked and then spent months having fun with it. So when the Lego version pads the events of the movie and adds its trademark slapstick humor, it feels a little done. But Lego Star Wars: The Force Awakens isn’t just about exploring the story of the movie. It’s about side stories the movie didn’t get to tell, like how C3PO got his red arm, or how Max von Sydow’s Lor San Tekka got the map that started this whole mess in the first place. If the game merely tacked these expanded story adventures on as bonus content, one might be tempted to play through those alone. Fortunately for the people who spent a whole lot of time putting the game together, there are mechanics in place to keep players from reading ahead. For example, I didn’t gain access to the story mission showing Han Solo and Chewbacca hunting for Rathar beasts until after the pair run into Rey and Finn in the core game. Even then, playing the mission requires the player to collect 30 of the 250 gold bricks hidden throughout the game first. Having just started playing, I’m not quite there yet, but I did collect the 10 gold bricks required to play through Poe’s heroic seafood rescue. Watch the whole mission below. No time to watch? Here are some highlights. Poe’s clever plan to infiltrate the Star Destroyer is to hijack a First Order transport and utilize a maneuver Lego Movie fans might find familiar. Tasked with opening Admiral Ackbar’s cell door, C3PO and BB-8 open every other cell door, which ends up being a brilliant plan. Fleeing the First Order guards, our heroes dive into the place all Star Wars heroes dive into when they find themselves in such situations. Admiral Ackbar thinks it smells delicious down there. Escaping the compactor, Poe and Ackbar find themselves in a firefight with First Order forces, showing off the game’s new cover shooting mechanic. See the trapped Wampa in the background? He doesn’t stay trapped. Just saying. On the way to their escape ship, the heroes interrupt one of the First Order’s exercise sessions. The music here is lovely. Poe and friends make it into space, but they aren’t out of the woods yet. What’s a Star Wars spaceship chase without a couple asteroids? The space battle moves through the asteroid field, into one of the larger rocks and out onto its surface, where an arena battle against Tie Fighters breaks out. Ultimately Poe must torpedo a trio of mounds on the surface, freeing the Mynocks nesting within the asteroid and escaping in the ensuing chaos. Mission accomplished, Poe, Ackbar, C3PO and BB-8 set a course for the Resistance base, where many better documented missions await. I’m about halfway through Lego Star Wars: The Force Awakens as I write this, tooling about on Takodana between story missions. I know how the main story ends, so it can wait. I need those gold bricks if I’m going to find out how Han Solo and Chewie lost an entire starship crew on a hunting trip.